We went on a trip to Crosby Beach because we are learning about ‘Another Place’. First, we got off the coach and looked at the view, which was impressive! Next, we went on the beach and went to the nearest statue and took a few photographs and selfies with it. Unfortunately, it was a little windy and we felt like we were caught in a sandstorm! Fortunately, after about fifteen minutes, the sun came out. 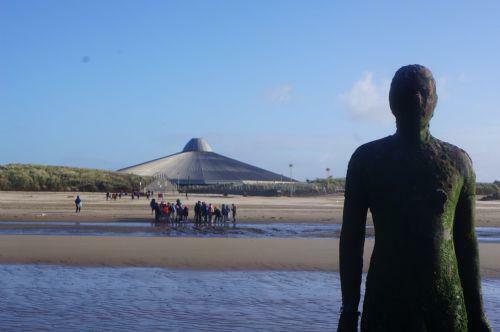 We went even further out and got a few more photographs with Anthony Gormley statues – we even held their hands! We went EVEN further out onto the beach and began to use pickers and gloves to get rocks, stones and other things, which we will add to our ‘Another Place’ display. Seeing the iron statues in real life has been interesting and I look forward to studying Anthony Gormley’s work more in school.